Learn about JRT trials and all of the events here, in Trialing 101. 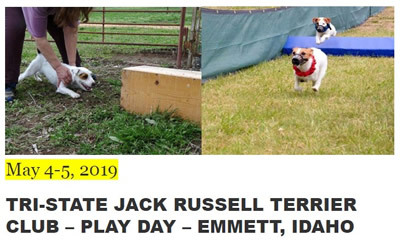 The Idaho Contingent will be hosting a play day in Emmett, ID on May 5th. This is a great chance to learn about the different events. We will be offering racing, GTG, Brush Hunt and Conformation Handling. For more information contact Lynn Hawley or Susan Getty. 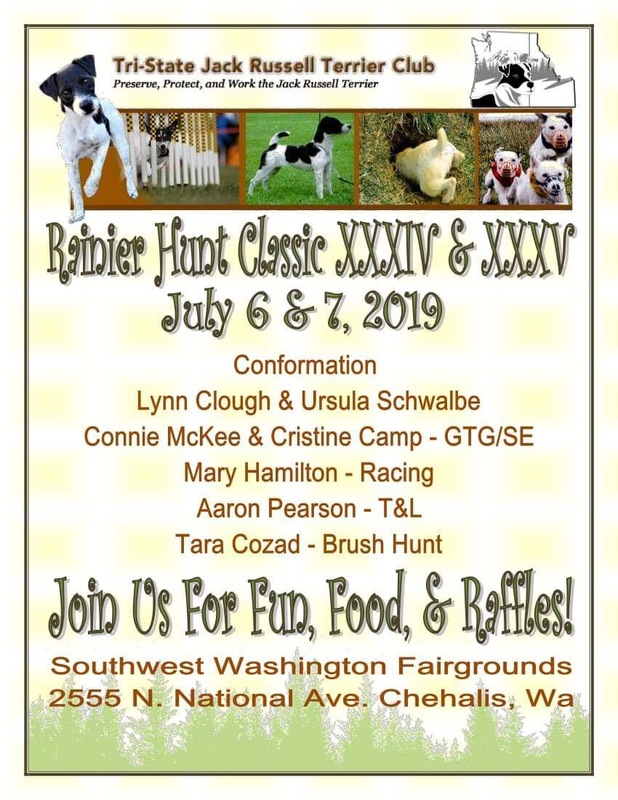 Mark your calendars for the upcoming 2019 Rainier Hunt Classic JRT trial. This annual event is a favorite of all Jack Russell Terrier lovers in the Northwest, and this year promises to be an exciting event. Keep an eye out for the trial premium for this exciting event. Sorry, the 50/50 raffle is sold out for Saturday's drawing. We will be opening up a new 50/50 raffle next week for a Sunday drawing. Stay tuned! Here is another great opportunity to win a valuable prize for a very modest cost. We are doing the Grand Prize Drawing slightly differently this year. You can still buy tickets for the drawing below; they are $5/each, or 11 for $50 (buy ten, get one free). The drawing will be held at the 2019 Rainier Trial, and the winner can select from three prizes of roughly equal value, shown below. 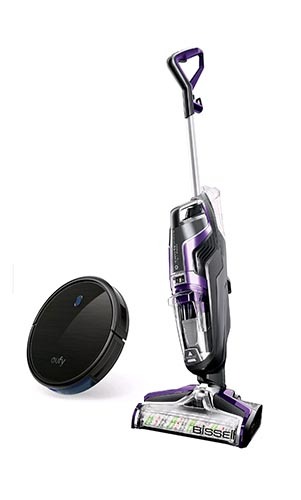 Note: the pictures shown are representative of the final prize, but not the actual item. We will offer a user-choice of gauge for this shotgun, from a limited selection. 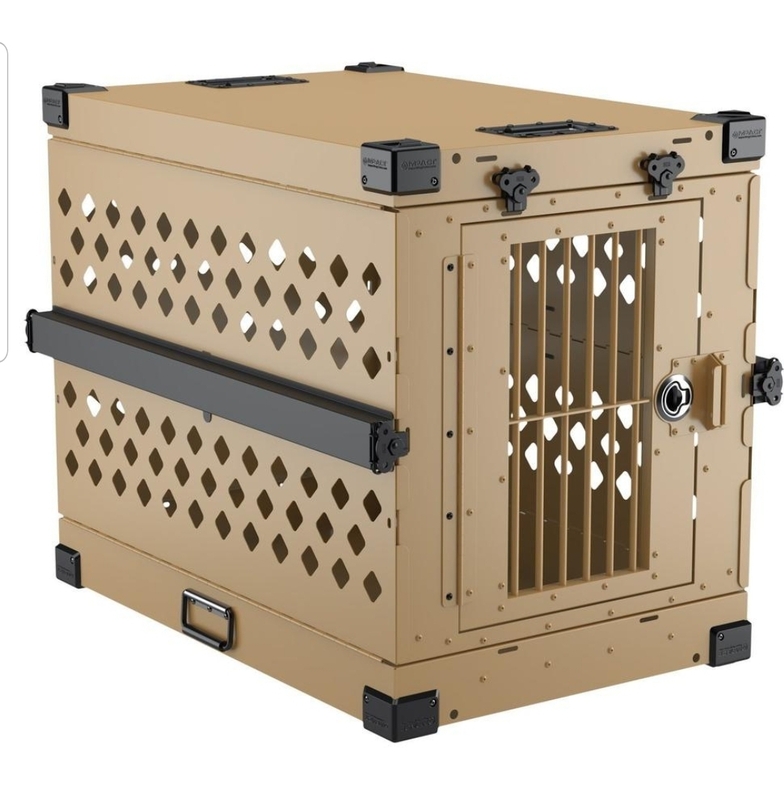 This wil be a size 200 (terrier-sized) impact crate for safely transporting your dog. This is a combination prize. To enter this drawing, please select the number of tickets below. As always, you can choose to pay through your PayPal account, or use a credit card.